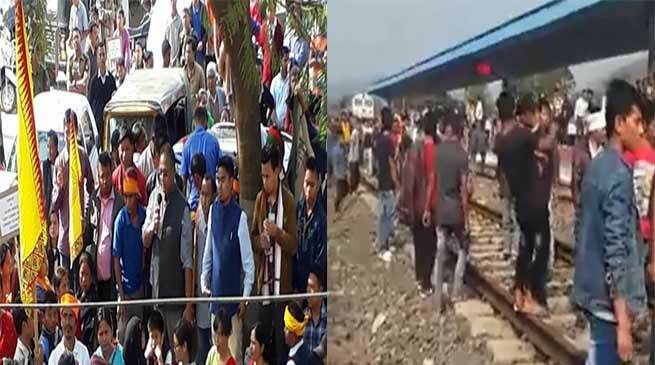 As many as 8 people and 25 policemen were injured in a clash between protesters against RSS and police on Thursday afternoon at Maibong railway station in Dima Hasao district of Assam. According to police source thousand of peoples gathered at Maibong railway station and started protesting against RSS . The protestors blocked trains and also took out the tracks. police repeatedly persuaded them for discussion but they started pelting stones at police. As many as eight protesters were injured after the police resorted to firing and 25 policemen also suffered injuries due to heavy stone pelting by the mob. One additional SP has been seriously wounded in his face by stones. We had no option but open fire,” police said. There is a curfew now at Maibong and the situation is under control. The protestors belonging to three Dimasa organisations—Jdike Naiso Hosom, the Dimasa Students’ Union and the Dimasa Mothers’ Association, had called for a 12-hour bandh in the district on Thursday to protest against the RSS. The bandh call came in response to a media report which stated that a RSS leader proposed a draft solution for the Nagaland peace process, which said that parts of Dima Haso would go to the greater Nagalim demanded by NSCN (IM) before the centre during the talks. The raging mob set an RSS Office on fire in the district on Tuesday.